Submitted Photo New Boston Village Administrator Steve Hamilton reads proclamation recognizing Eagles. 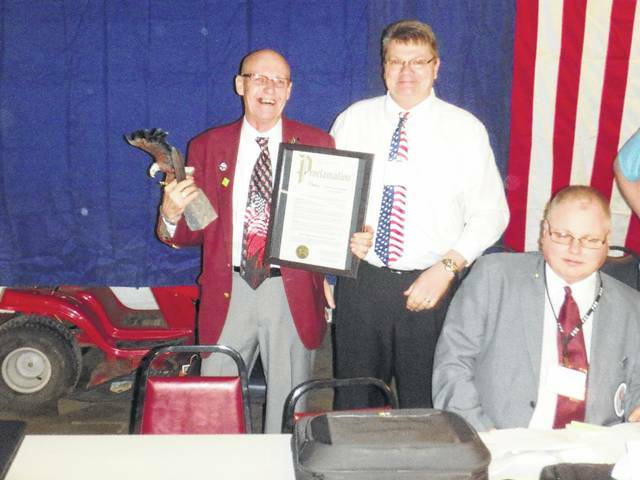 New Boston Village Administrator Steve Hamilton presents proclamation to Eagles Worthy State President Randy Wenger. Eagles members came from far and wide for the Central Zone Spring Conference held for the first time at the New Boston Eagles Aerie 2271. In Ohio, there are five zones. New Boston is located in the Central Zone. The conference attracted 75 members including national ranking members that came from as far away as Minnesota. Bill Hanley, 2271 secretary, explained that the event started Friday night and lasted through the weekend. Entertainment included a karaoke contest and live musical performance. Saturday’s events even brought out some local celebrities. Village Administrator Steve Hamilton read a proclamation issued by Mayor William Williams Jr. recognizing Fraternal Order of the Eagles members for their “dedication, commitment and contribution in making our community, our state and our great nation ’ under God’ a much better place to live, grow and prosper.” Appellate Judge Marie Hoover and New Boston Police Captain Steve Goins also joined in the festivities, helping to judge students participating in the God, Flag & Country program. “It was beautiful,” Hanley stated. God, Flag & Country is a program that start in 1967. Through the program, Eagle Clubs ask students ages 10-15 to present a three minute speech explaining what God, the flag and their country mean to them. Six students, three from Zanesville and three from Chillicothe, gave speeches on Saturday that were judges worthy to go on to the state level. Winners from the state competition will continue on to nationals in Reno, Nev.
“This is a great program,” Hanley commented.